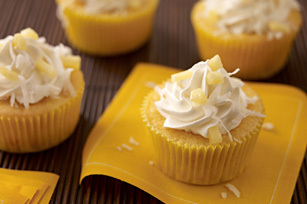 Do you like piña coladas and tasty cupcakes? What about pineapple and coconut? Well, these cupcakes were made with you in mind. Beat first 4 ingredients with mixer until blended; spoon into 24 paper-lined muffin cups. Bake 20 to 25 min. or until toothpick inserted in centres comes out clean. Cool cupcakes in pans 10 min. Remove from pans to wire racks; cool completely. Frost cupcakes with Cool Whip. Garnish with coconut. Store unopened packages of coconut at room temperature. After opening, place the package in an airtight container and refrigerate or freeze for up to 6 months. Garnish with chopped dried pineapple.